Who’s that naked flying man in front of the library? I’ve always loved the odd statue in front of Clemons Library at the University of Virginia. It stands out so audaciously against the staid, predictable colonial architecture for which the University is famous. The bronze statue of a well-muscled figure about to push off from the earth into flight stands 12 feet high, and sits on a solid pedestal. 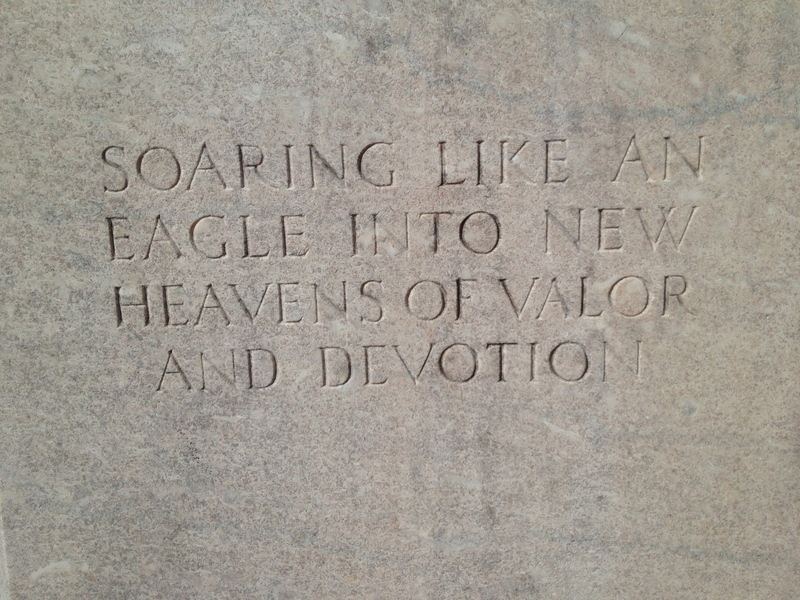 But rather than seeming heroic, it has a very human feel to it. Aside from the strap-on pair of wings, the figure is wearing only a comical looking helmet and what looks like a jockstrap. He is perched precariously on a lumpy, malformed globe. His stance is awkward and unsure. It could be the depiction of an escapade dreamed up by inebriated frat boys. 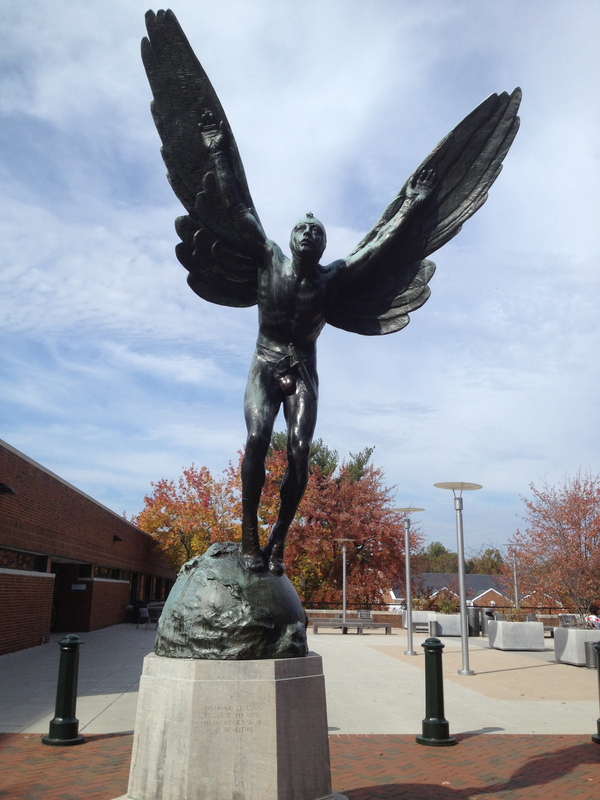 So who is this naked flying man who graces the courtyard of Clemons Library? James Rogers McConnell entered the University of Virginia in 1907. He wholeheartedly launched himself into the life of the college, becoming in short order: the King of the Hot Foot Society (now the “IMP Society”), the Editor-in-Chief of the now defunct Corks and Curls, the President and co-founder of the Aero Club, a member of the Seven Society, a member of Beta Theta Pi, and a cheerleader. He gained a reputation for being a prankster, a hard-drinking frat boy, and a bagpipe player. He dropped out after only two years in the college and one year at the law school, (too much partying, not enough studying, perhaps? ), but during his short time at the university, and indeed in his short time on earth: he lived his life with gusto. In 1915, McConnell sailed to France to join the war effort. For a year he drove an ambulance for the American Ambulance Corps on the Western Front, earning the Croix de Guerre for bravery. Feeling compelled to do more, he joined the French Air Force and became one of the first members of the Lafayette Escadrille, a group comprised largely of American volunteer fighter pilots. The next year, while recuperating from a back injury caused by a rough landing, he wrote a memoir entitled Flying for France. On March 19, 1917, 30 year old James McConnell was killed when his plane was shot down during aerial combat with two German fighter planes. America had not yet even entered the war. Alumni petitioned the university to honor this somewhat unlikely hero and UVA dropout as a model of courage and self-sacrifice. A press release from President Alderman’s office dated June 23, 1919 says, “There was a certain singular quality of heroism in the circumstances of his devotion and death that make a great appeal to the students and alumni of the institution.” Gutzon Borglum, the Danish-American sculptor best known for the monumental carving of the presidents on Mount Rushmore, was commissioned to create the memorial. Armistead Dobie, the judge and UVA law professor who accepted “The Aviator” on behalf of the university described McConnell with these words at the statue’s unveiling: “To me the most characteristic trait of Jim McConnell’s nature was a hatred of the humdrum, an abhorrence of the commonplace, a passion for the picturesque.” (University of Virginia Alumni News, Vol. VII, July 1919, Number 12, p. 252). Over the years the statue has been called an unseemly eyesore and there have been calls for its removal, but I’m guessing that McConnell would have heartily approved of the tribute. owonderful • This entry was posted in Uncategorized and tagged James Rogers McConnell, University of Virginia. Bookmark the permalink. ← “Girls don’t play soccer…” – ! I find the statue somewhat revealing but a fine tribute to my ancestor. I hope it remains at the library. I was just admiring it again this afternoon on my way to a meeting in Clemons!